With autumn arriving and the daylight hrs getting shorter and shorter my mind was turning to my lighting. Don't get me wrong I simply LOVE my CREE headlight but one a couple of occasions I forgot to charge the battery and found I had to commute with my backup flashers. I always have atleast 2 sets of fully working lights on BBB just in case batteries run out on my main set but I always find a BIG difference in what I see and the way the traffic actually interact with me while riding. With the big CREE headlight EVERYONE sees me coming and I have no problems with getting cut up by other traffic or people walking out infront of my just as I'm riding past. When riding with my back up flashers its a hell of a different story. It wasn't a hard deciding which dynamo I was going go with anytime I have asked anyone about dynamos Schmidt's Original Nabendynamo (SON) has always been mentioned regarding there reliability and no maintenance. 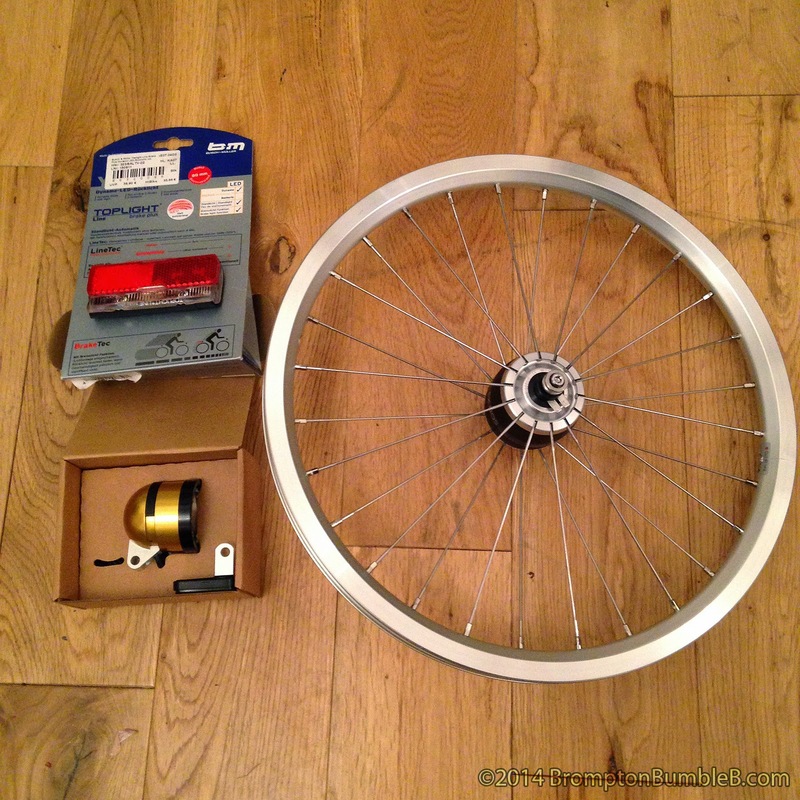 With that I ordered up the new SON XS Brompton front wheel hub in silver and black from . I could have got yellow but would have taken an age to get. 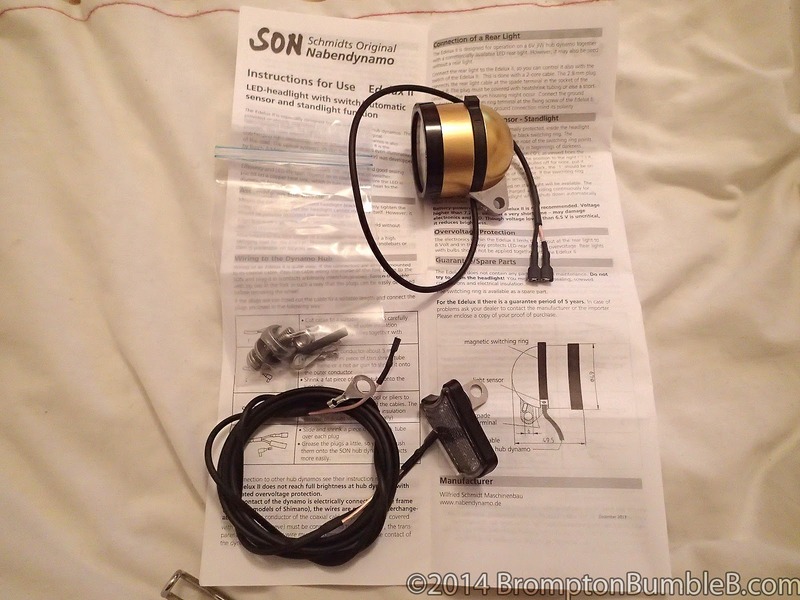 Also ordered the SON Edelux II LED Headlight & Busch & Müller Toplight Line Plus dynamo LED-rear light brake light. 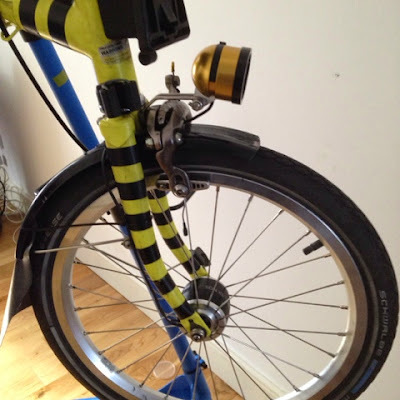 Fitting was easy, just replacing the light front wheel with this one, being a front wheel it was done within minutes. The longest part was swapping the Marathon tire and inner tube over. 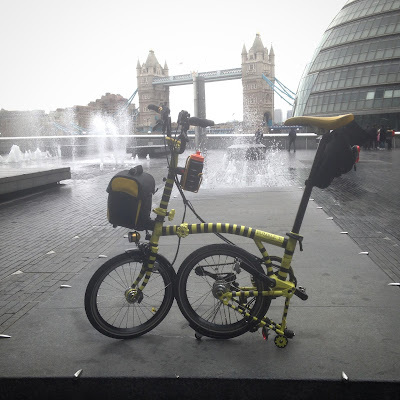 When I was trying to install the Busch & Müller Toplight Line Plus dynamo LED-rear light brake light I realised I ordered the wrong one, the mounting is too wide for the Brompton's bracket. I got the 80mm version and not the 50mm which the Brompton bracket is so I will have to exchange it. Connecting the rear light is simple enough just a cable that the light comes with plugs directly into the Edelux II and controlled by it too. 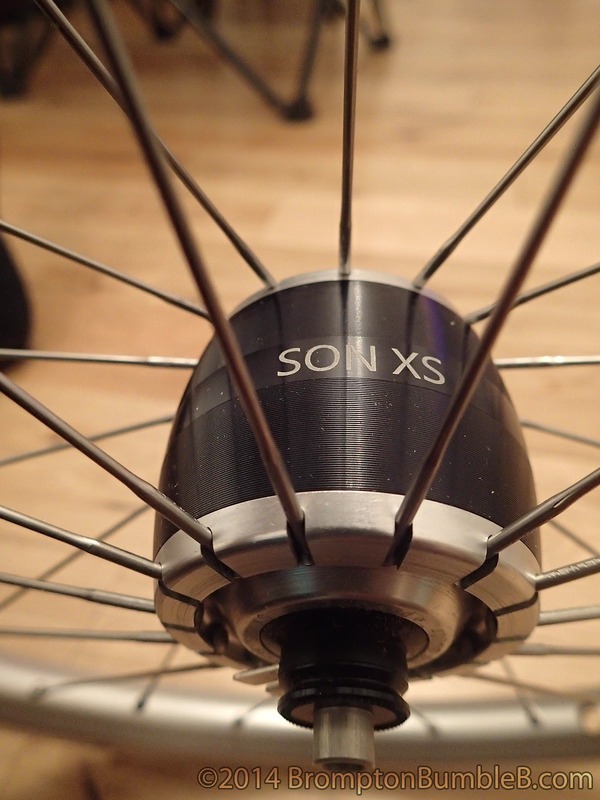 I have ridden with the SON XS hub and my greatest fear was that I would feel some resistance, but I'm happy to report I found it no different than before tbh. I have to get used to not being able to turn it off instantly using the switch as even when you turn it off the light stays on draining the charge from the inbuilt battery which takes about 4 minutes. In some situations like on a train station platforms this could be a problem as your not supposed to have any lights on the platform as the driver could confuse it for a signal. Luckily by the time you've entered the station and got to the platform is more than 4 mins and will be off. The B&M rear light also turns off as it is connected to the same circuit as the Edelux II so will turn off and on at the same time but also has its own off button too. As of this posting I have actually used the light twice and I'm very pleased with this upgrade. Just need to get the rear light and it will be complete. Quick video I just edited together.... Need to go somewhere proper dark to really show it off though. 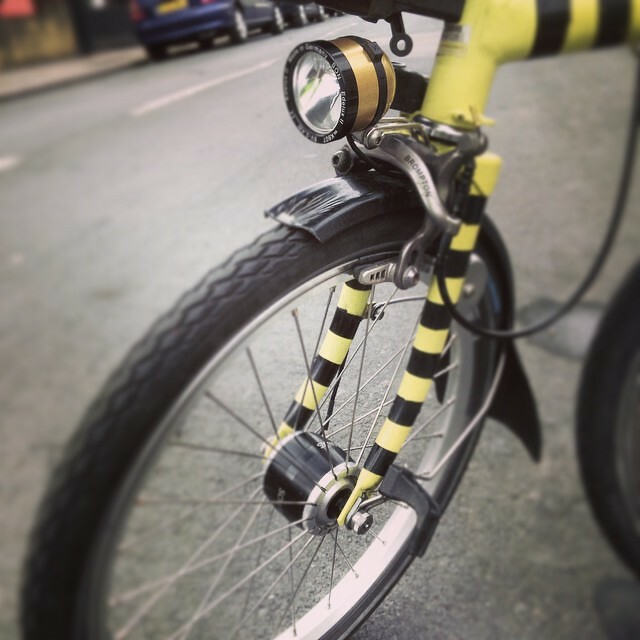 I put my light on the bars so not to be hidden from other road uses by the bike. A great place to mount it too. Never thought of that but I'm happy where mine is. Where did you source the hub and wheel builder from, if don't mind me asking. Thanks! Does the Edelux II fit OK underneath the luggage carrier? What mounting bracket did you order with it? I got mine from SJSCycles.co.uk & came with the mounting bracket. 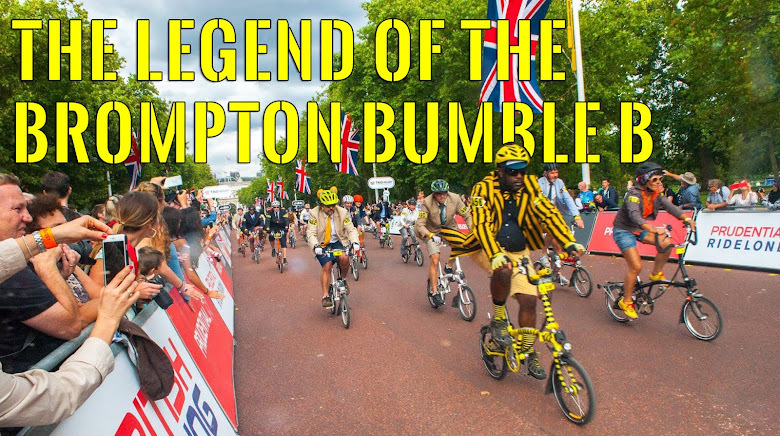 Fits fit with Brompton Bags with plenty of clearance, No problems. The one provided with the Son is ratty : only to be seen, not to see as too weak.